Selling for $14.99 at BC Liquor Stores, and perfectly paired with seared Calvados-infused pork chops, roasted rosemary and garlic potatoes, and spicy cashew green beans, this Oliver-based Riesling was a pretty big hit at dinner on September 22, 2012. 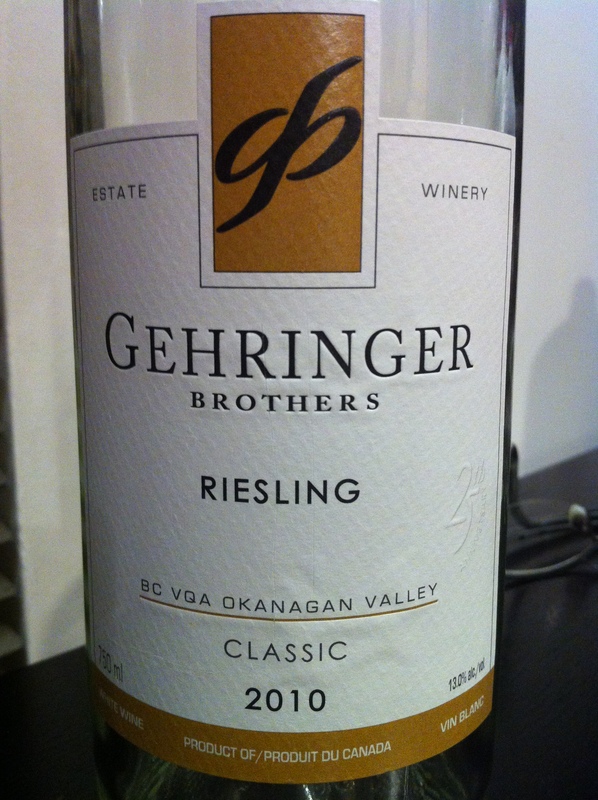 Every single guest agreed that this off dry Riesling from the Okanagan was one that they would buy again. So, what made it so special? Gehrginer Bros. 2010 Riesling is representative of New World Riesling goodness. It was a genial wine – one that would not offend by way of that petrol-likeness that many Rieslings can contain. Now, I personally adore the petrol essences that Rieslings carry, but this wine did an excellent job at managing fruit, minerality, and flower characteristics, while keeping its crispness. This wine was not flabby, flaccid, or flimsy in any way; it was fabulous, fantastic, and first-class. Brightly clear and pale lemon green in colour, this Riesling’s bouquet was of surprisingly light intensity, as it represented a most interesting mix of citrus (lemon, lime), pear, Granny Smith Apple, unripened fuzzy peach, violet nuances, and the most delicately (and complimentary) petrol notes. The interface on the palate was just slightly different: pleasing tart kiwi and white stone, with a citrus backbone. The acidity was altogether favourable on the palate, and its light+ body was surprisingly engaging. Interestingly, the Riesling varietal is widely planted around the globe, however, it lost its “umph” as a wine that people desired. Many critics say that it will never resume its former chic status. I am one of the few hopeful wine consumers, who will advocate Riesling as one of the most underrated wines in the world. It is not only being experimented with (take, for example, Karma Vineyards’ “Griesling” that I reviewed earlier – a mix of Gewurztraminer and Riesling), but it is being made into wonderfully-balanced wines like this 2010 Gehringer Brothers product. We can’t forget, however, that British Columbia as a wine growing region is very up and coming. I say, let’s set the stage for Riesling to come back into fashion — just like those tight skinnies that are haunting us from the 80s. ← Clos du Soleil’s First Annual Vertical Tasting – Enter NOW! !